As already mentioned previously, we enter Australia with a working holiday visa valid for one year. To be able to renew this visa for another year, it is necessary to work in a specific job position and in a regional area for a period of 3 months or 88 days. You usually work either in the agricultural sector, in construction or in mines. In the beginning, we are not very interested in extending the first year visa. We are looking for a job that allows us to save enough money to continue travelling. We would like to do something different, in contact with local people and nature, since we've already worked for 5 months as a waitress in Sydney. 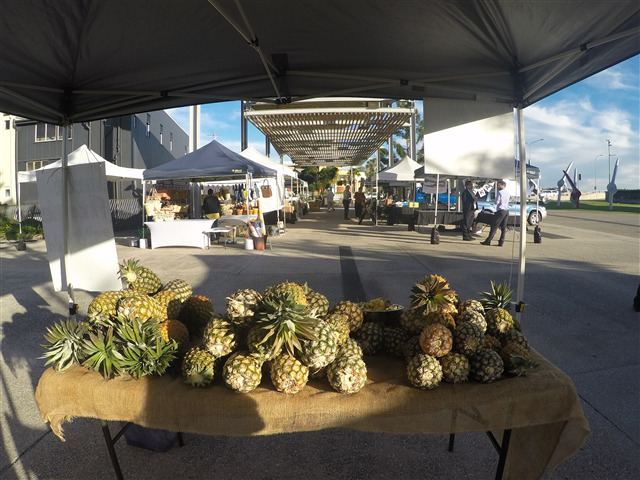 So by pure chance, thanks to a nice community of Italians met in Mackay and especially thanks to our friend Davide, we start working in a local pineapple farm in Koumala (1 hour from the city of Mackay). We start on the first of June. As soon as we arrive, we just want to give up. We are in the middle of nowhere, surrounded only by pineapple and tropical forest. That sounds maybe not so bad. But the main problem is that we are going to live in a shack (call it home would be too much), inhabited by a farmer of 79 years and many friends with 2,4,6 legs: 2 dogs, mice, frogs, snakes, spiders, bats and so on. After the first bad impression, we realize that the work is not so bad and that our boss, Arti, is really nice to us. And then once we try one of these delicious pineapples, it's impossible to leave this place. In short, we get used to the new environment! The tasks we carry out are mainly the following: collect pineapples to sell them on Wednesday at the local market of Mackay (Greater Whitsunday Farmers' Market), collect the roots under the plants and then replant them, so plant pineapples, drive different tractors and sometimes remove the weeds among the growing plants. The work takes place from 7.30 to 4.30, from Monday to Friday, with an hour of lunch break. Saturday is optional. After work, we have our space among the various pineapple fields to practice 1-hour sport every day. We really appreciate this paradise surrounded by nature. Then, after a shower, we have dinner at 7 pm and then nice chats or play board games with the old man and other guys who work with us: Daniel, Bianca and Vera (Germans) and Alessio (Italian). In the evening, around 9.30 / 10 pm, we go to bed because the alarm rings at 6.45 am the day after. There is nothing more beautiful than waking up and seeing the sunrise with an orange sun that colours the whole sky. After the first week, we start to calculate how long we need to stay in order to earn as much as possible. So we decide to leave after 8 weeks of work. We then start travelling through the Australian desert and Indonesia. But, only once left Australia, we realize how much we would like to come back for the second year. The truth is that, especially the journey through the Australian outback, has bewitched us. And we cannot think of anything else but come back to live in a car and explore the unspoiled nature. So we decided to contact the farmer to ask if we can still work in the farm in order to complete the 88 days that we need to renew the visa. He actually was really happy to have us back because he appreciated our planting job. So we come back to the Koumala’s pineapple farm for another month. Once back in, the only difference we notice is in the landscape: indeed we left a lush vegetation and we find a dry landscape, due to the summer that is coming. In general, this experience has been a very positive one, contrary to many backpackers who are usually exploited and underpaid. Our hourly pay is $ 19.50 gross, not much if we consider the national average and 15% tax off. But it has been 3 months in which we have learned so much and it was a good place to relax our body. Despite some works a bit heavy especially for the back, we could work out in the nature every day after work, returning to a routine that we did not have since many months. We also managed to combine work with fun and new friendships. During the weekend, in fact, we took the opportunity to go to Mackay and see our friends Davide and Rossano. The last few weeks we have also met a local family who lives 10 minutes from our shack. Andrea and Alan, a couple in the fifties who "adopted" us every weekend preparing delicious food and giving us lots of affection and attention. We will never stop thanking them! In short, we met really fantastic people. Not to mention our boss Arti, who preferred Marica to share a glass of rum and coke in the evening, while Sonia to drive the tractors. He was like a grandfather for us and treated us like daughters. In the end, it was an experience that enriched us both from the working and, above all, human point of view.We will come back soon to this wonderful land that has changed our lives!